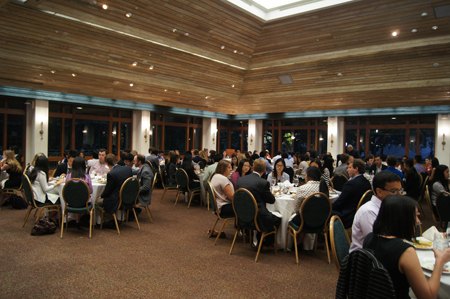 The Honors Business Association held its annual Company Dinner on Wednesday, October 14th. 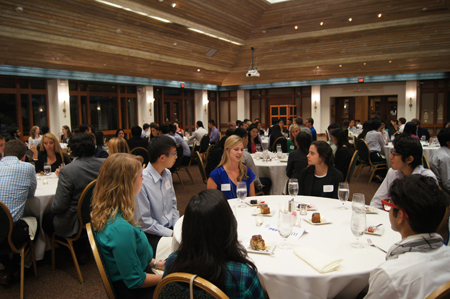 Approximately 120 guests spent their evening at the Etter-Harbin Alumni Center enjoying a delicious three-course meal and developing new professional connections. At each table, students engaged in meaningful discussions with company representatives. Students learned about the representatives’ professional experiences and gained new insights about making the transition from college to the workplace. Company representatives, some of whom were BHP alumni, shared stories about their career paths and the skills they gained from college that have helped them in their work. The 2015 Company Dinner was a great success, continuing to serve as one of the most popular ways for BHP students to build their professional network. This entry was posted in Event Recaps. Bookmark the permalink.